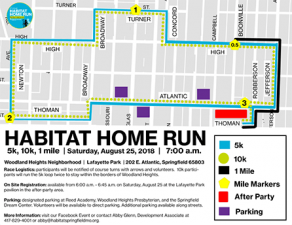 Pick your distance at the Habitat Home Run with a 5k, 10k, and 1 mile fun run option. Start and finish at historic Lafayette Park (202 E. Atlantic) in the Woodland Heights Neighborhood. A fast, flat, and shady route that have been revitalized by Habitat’s construction team and volunteers; see charming features the Moon City Creative District, and more! After the race, stick around for our after party! We’ll have great refreshments, entertainment and bounce houses, and great children’s activities to enjoy in Lafayette Park! Children under 5 may participate at no charge, but will not receive a shirt or bag. Participants with strollers and walkers should start at the back of the group. Race day registration begins at 6:00 a.m. on Saturday, August 26 at Lafayette Park. 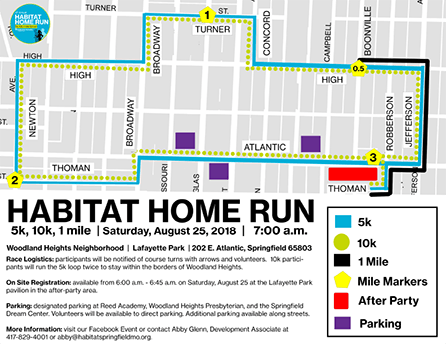 Collect your race packet at the Habitat for Humanity ReStore from 9 a.m. to 6 p.m. on Thursday, August 23, and Friday, August 24. Your packet will include vendor goodie bags, an event shirt, race bib, and race day instructions. Packet pick up is also available on site from 6:00 a.m. – 7:00 a.m. on Saturday, August 25, 2018 at Lafayette Park – 202 E. Atlantic. Parking for race participants can be found in designated parking lots at Reed Academy, Woodland Heights Presbyterian, and at the Springfield Dream Center. Volunteers will be available to direct parking. Additional parking can be found along side streets. Top 3 male and female participants in both 5K & 10K.